The National Weather Service in Honolulu has extended the flash flood warning for Hawaii Island until 2:30 a.m. Saturday (March 26). At 11:17 p.m. weather radar and gages continue to report heavy showers and thunderstorms moving across the north Kona and both Kohala districts. This rainfall falling over already saturated grounds will likely result in additional flooding within the warning area. Emergency management have reported flooding along Highway 270 and Mamalahoa Highway (Route 190) in the Kohala area. Locations in the warning include but are not limited to Hilo, Kailua-Kona, Kapaau, Honokaa, Honomu, Kamuela, Puuanahulu and Pohakuloa Camp. 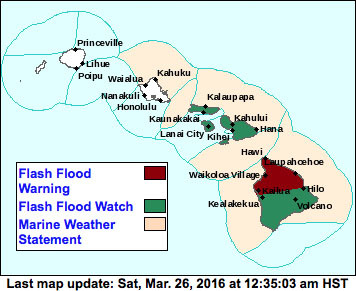 A flash flood watch is also in effect for Hawaii Island overnight. Areas in the watch include, but are not limited to, Kona, Ka‘u, north and east Kohala, Hawaii Island interior areas and mountain summits.